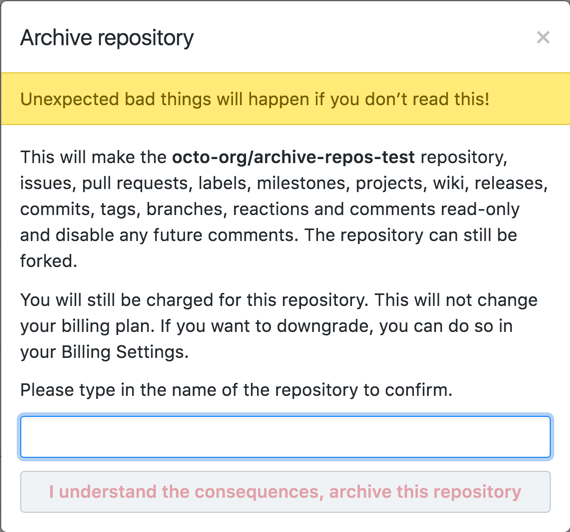 You can archive a repository to make it read-only for all users and indicate that it's no longer actively maintained. You can also unarchive repositories that have been archived. We recommend that you close all issues and pull requests, as well as update the README file and description, before you archive a repository. Under "Danger Zone", click Archive this repository or Unarchive this repository. Type the name of the repository you want to archive or unarchive. Click I understand the consequences, archive this repository.